"A rags to riches to rags story." The film entitled the Jerk is all about the life and experiences of Navin Johnson. Johnson is a young man living in poverty so much so that he does not even have a home. In this film, he talks about his own life in the form of a story. Johnson was adopted at a very young age by an African American family. He grows up with this family not knowing they are not his biological parents, however certain aspects distinguish him from the rest of the members of the family such as the color of his skin. Johnson follows the sound of music one night all the way to St. Louis where it was being played. He succeeds in getting a job at Harry’s gas station where he also finds shelter. Being a worker there, his name is included in the phone list and he is amazed when he finds out. Not long after working there he falls prey to a troublesome guy who also works there. One day while working, Johnson makes an invention by use of glasses and gets an offer from a customer known as Fox who suggests they market the discovery and share the profits. Later on, the troublesome guy tries to kill Johnson but fails as Johnson escapes all the way to a traveling carnival where he gets another job. At his new job he meets Patty, with whom he starts a relationship. Later on, he meets Marie and while on a date with her, Patty comes face to face with them but Marie sent her away. However their relationship does not last as Marie dumps him since he is very poor. Not long after the heartbreak, he gets a message from Fox telling him his glasses invention has been marketed and is generating a lot of money and Johnson is entitled to half the profits. He becomes very rich and marries Marie. Later on, Johnson goes bankrupt, becomes very poor but is rescued by Marie and they live happily ever after. 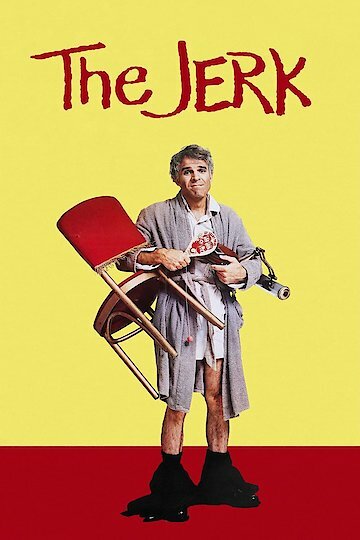 The Jerk is currently available to watch and stream, download, buy on demand at Amazon Prime, Starz, Amazon, Vudu, Google Play, iTunes, YouTube VOD online.